Fig. 1. Senotherapeutics targeting SCs. CS induced by diverse factors is involved in many biological processes, embryonic development, tissue homeostasis, and tissue dysfunction, thus contributing to age-related pathologies and lifespan. Therefore, senotherapeutics targeting SCs is an emerging strategy of aging intervention for extension of health span and prevention and treatment of ARDs. 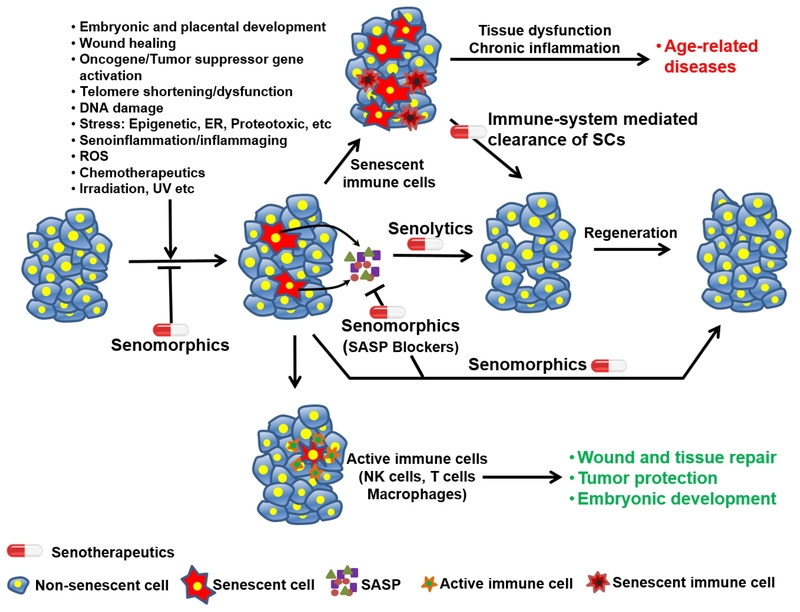 Senotherapeutics is comprised of 3 classes: senolytics which kill SCs selectively; senomorphics which modulates or even reverses the phenotypes of SCs to those of young cells by interfering with triggers of CS, targeting SCs directly, or blocking SASP: and mediators of the immune-system clearance of SCs.